The Peg Perego Book Plus is both practical and functional, not to mention absolutely stunning! 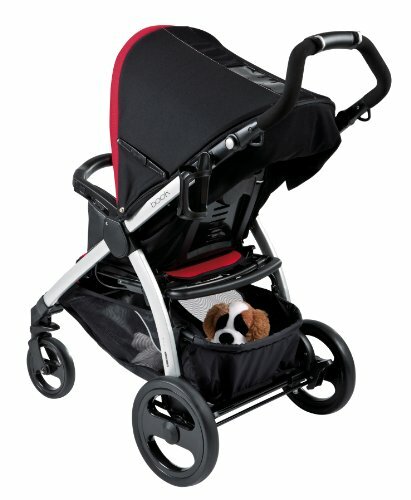 Peg Perego has two Book strollers, the Book and Book Plus. What is the main difference between the Book and the Book Plus? The Book Plus has a reversing seat and costs about $100 more. Book Plus also has the option of getting the entire modular system. More on that later, though. 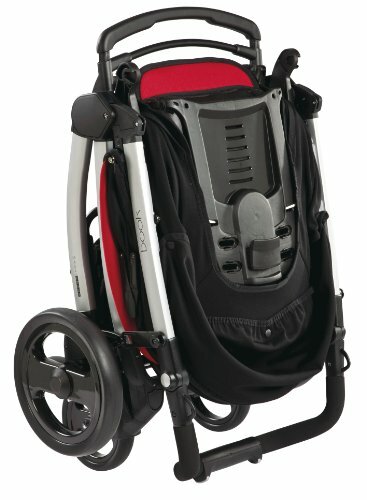 For simplicity’s sake, the focus on this article is on the Book Plus, but know that all the same features except for the reversing seat are the same for the regular Book stroller. The seat has a deep recline, and accommodates the Primo Viaggio SIP 30-30 car seat as a travel system. 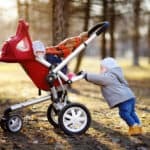 Let’s explore more of the features and how this stroller can help you, and then we’ll go into what Book Plus owners have to say. 1 What is folding the Book Plus like? 3 A unique sun canopy. 7 Where can you find the best price? The Peg Perego Book Plus is a mid-sized lightweight stroller weighing just under 22 pounds. The aluminum frame is light and strong, making it easy to carry, and yet it is so durable that it can last for more than one child. This stroller holds up to 45 pounds but light enough to carry one-handed. What is folding the Book Plus like? The Book Plus features a one-hand folding feature and is most compact with the seat parent-facing and fully reclined. 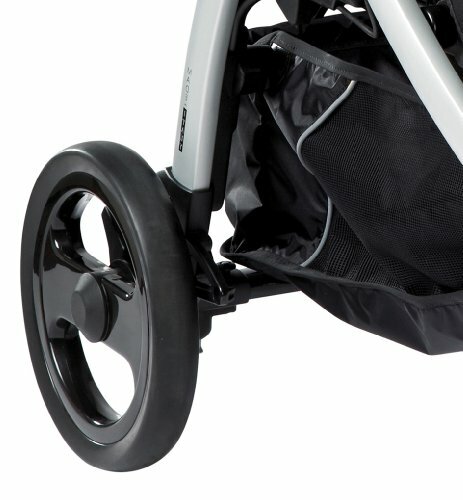 In one swift motion, the stroller is folded (just like a book, hence the name!) and you don’t have to take off the seat. An auto frame lock on both sides of the chassis holds it together for better storage. 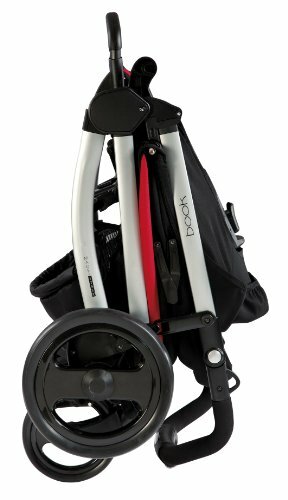 Now you can hold your baby in one hand and fold your stroller in the other, because that’s what we moms do. I also like that you can pull your stroller behind you like luggage. I love the steering on the Book Plus! It glides along and turns on a dime. The secret is in the handle design, where the plastic grip in the middle allows for one-handed maneuvering. The handle is height-adjustable, going from 34 inches up to 42 inches for the tallest parent. The first thing that has to be mentioned is the soft yet elegant fabric. 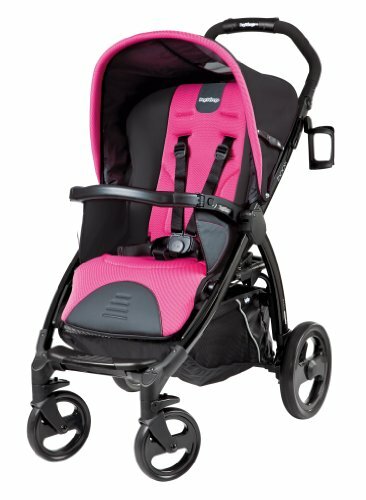 I absolutely LOVE the rich colors on this stroller! The padding is cushy yet supportive and the side panels at the top of the seat cradle your child’s head while napping. The Book Plus has a 5-point harness that keeps your child safe and secure in the seat, and a swing-away, removable bumper bar is included. The Book Plus has a fully supported, four-position backrest that reclines flat, and therefore can be used for newborn babies. Secure the footmuff over the bumper bar and you have a bassinet-like infant enclosure. When your baby is very small, having support for little legs is important, both for healthy circulation and for comfort. The Peg Perego Book Plus has a two-position leg rest, either up or down, so your baby’s feet don’t dangle. I love the sun canopy on the Book Plus because it’s huge and does a fantastic job shading your child. It goes all the way down to the bumper bar! (As you can see in the photo on the right.) The sun canopy has a peek-a-boo window on the top so you can check in on your child. Moms say that when the seat is upright, the sun canopy goes as low as the bumper bar, which allows protection from the sun and wind. The hood also unzips in the back to transform into an airy “floating” sun canopy. Strolling in the park on a summer day is no longer a problem if it gets a bit too warm with the Book Plus stroller; just unzip the back to get some full air flow, yet your child is still shaded. The Peg Perego Book Plus has an enormous storage basket that is big enough for a large diaper bag and plenty of other things. I like the drop down feature that gives me easier access to my things when the seat is in recline. There is also a parent cup holder included; it is removable and can switch to either side of the chassis as you prefer. A rainshield is also included and handy to have around in case of bad weather. And the fashionable footmuff easily snaps over the bumper bar to keep baby warm and cozy. Or with the footrest up and seat reclined, the footmuff becomes a bassinet-like infant enclosure. More accessories will soon be available such as the Navetta bassinet and the Pratico toddler seat. This page will be updated as soon as they come onto market. In the meantime, check out the beautifully co-ordinated Borsa Soft diaper bags that has hook attachments to connect with your Book Plus handle bar. Because this stroller is so new, there are not many reviews for it yet, but the reviews that are out there give the Book Plus a high rating. Parents recommend the Peg Perego Book Plus for the smooth ride, gorgeous and fashionable colors, and one-handed easy fold. The large storage basket is a major plus; parents say that it carries a lot including the heavy electric Medela pump system. Parents say that they wish the colors were brighter, but as far as quality and performance of this stroller, there aren’t many complaints. Where can you find the best price? While this is a new Peg Perego stroller, most retailers are charging full price. And I don’t know about you, but I really like to shop at Amazon just so that I can also buy a couple of other unrelated items along with my big purchase. It’s really convenient that way! 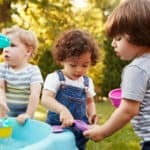 Just imagine how great you’ll feel in a few days when you take your new Peg Perego Book Plus around your neighborhood. You’ll get a lot of looks with this beauty.